This Crispy Duck and Pancakes recipe is a quick and easy take on one of my takeaway favourites. I made this recipe up when I couldn’t wait for a Chinese takeaway. The takeaway said it would take them at least an hour to deliver, which I suppose any sane person would just wait for, but I decided to set myself the challenge of making the same thing in that time instead. I ran to the shops, picked up duck breasts, pancakes and cucumber and hurried back to make my own version. It’s not exactly the same, but I think it’s pretty good, and if you’ve already bought your ingredients it’s ready in under half an hour. Score the skin of the duck and rub with a little of the five spice and most of the salt. Place a non-stick frying pan over a high heat and lay the duck breasts in skin side down. Cook for 10 minutes until the skin is very crispy and the fat rendered out. Pour away most of the fat then sprinkle the meat side with the rest of the five spice and salt. Turn the breasts over and cook for 5 minutes before turning them back over on to the skin side to cook for a minute or two more. Set aside on a plate to rest. Peel and deseed the cucumber and cut into thin matchsticks. Halve the spring onions and slice each one lengthways into thin matchsticks. Fill a bowl with cold water and ice and drop the spring onions into it. Warm the pancakes according to the packet instructions. Finely slice the crispy-skinned duck breasts, and drain and pat dry the spring onions. 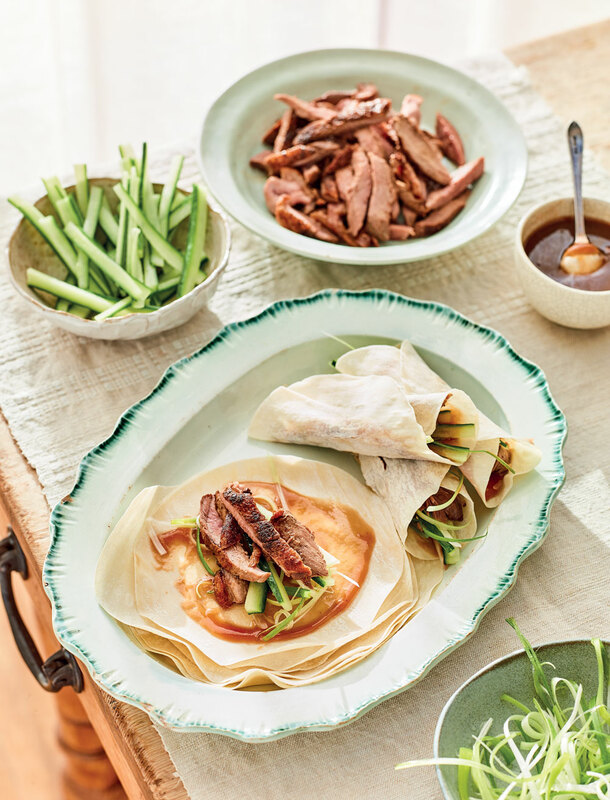 Serve the pancakes with a splodge of hoisin or plum sauce, slices of the duck and a few cucumber and spring onion pieces.